Two mellow dwellings short walk to Woods Cove Beach; accommodates 2 families. Property has two dwellings and can be rented as a compound or just the front Cottage. Front Cottage has 3 bedrooms-Master bedroom is a Queen while other two bedrooms are Full- and two baths and can sleep 8; it has two living rooms which could allow for separation of children's quarters and adults, kitchen is intermediary....Back house is full Napa with reclaimed wood siding and floors with metal roof and large covered deck; it has one bedroom with a king bed and two full bathrooms and keep sleep four including the convertible couch. Property has nice common space of a bbq, lounge with bar and beer on tap, ping pong, and so on. Both houses have nice ocean views. House is our home. We would be happy to be a resource (we mountainbike, play tennis, snorkel, surf, skateboard, hike, golf, kayak, paddleboard, and so on) for your vacation as I have worked, played, and lived here for 20 years. House is well supplied with tandem kayak, one SUP and one prone paddleboard, beach chairs, surfboards, frisbees, snorkel stuff and so on. We bought house because of its character, history, and location. It was run down and unimproved but I have slowly refurbished it wall by wall and been true to the historic nature of house and materials (no drywall anywhere). It now has modern electrical, plumbing, and insulation. Windows are double paned and quiet. House gets lots of compliments. Multiple seating/dining spaces on the property. Easily enjoy dinner for 12 on the deck, around the paella oven in the adirondacks, or inside at vintage mid century dining table (seats 4). Two seperate homes on this spectacular beach compound. Both homes or main house can be leased. This laid back historic surf shack is less than a 5 minute walk to Woods Cove, one of the prettiest beaches in California, perfect for swimming and snorkeling. Also walk to shops and restaurants, or catch the free trolley into town. 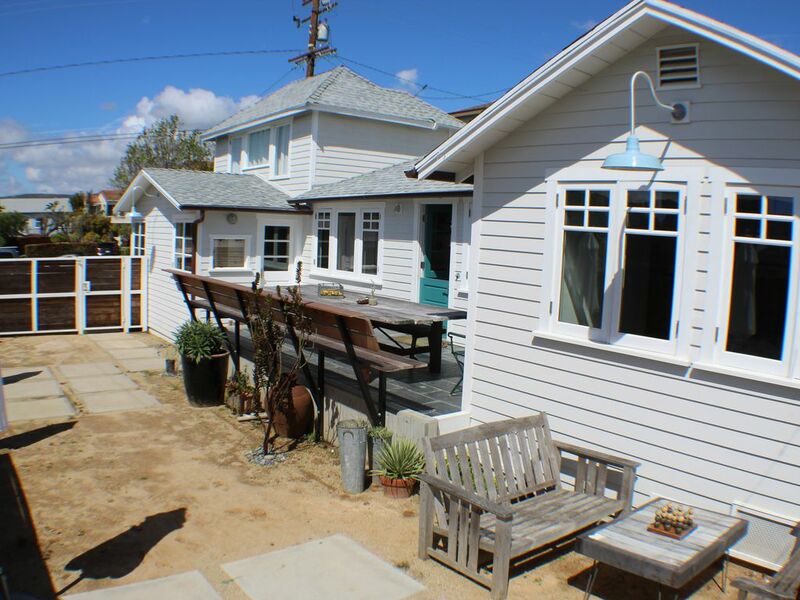 Built in 1927, the front house is an authentic space that captures the relaxed vibes of SoCal surf culture. It has a fully stocked kitchen, 3 comfy bedrooms, two full bathrooms, and a front deck that seats 12. The outdoor space with native landscaping feels like a Napa winery, complete with custom paella oven. The back house also has a front deck for reading and hanging out, with one bedroom, convertible couch and two full bathrooms. This compound is perfect for a family (or multi-family) vacation, less than an hour drive to Disney and Knotts. Bikes, surfboards, kayak, stand up and prone paddleboard, beach chairs and towels included. From Lonely Planet: "It’s easy to love Laguna: secluded coves, romantic cliffs, azure waves and waterfront parks imbue the city with a Riviera-like feel. But nature isn’t the only draw. From public sculptures and art festivals to free summer shuttles, the city has taken thoughtful steps to promote tourism while discreetly maintaining its moneyed quality of life (MTV’s reality show Laguna Beach being one drunken, shameless exception)." One of the earliest incorporated cities in California, Laguna has a strong tradition in the arts, starting with the plein air impressionists who lived and worked here in the early 1900s. Today it’s the home of renowned arts festivals, galleries, a well-known museum and exquisitely preserved arts-and-crafts cottages and bungalows that come as a relief after seeing endless miles of suburban beige-box architecture. It's also the OC's most prominent gay enclave (even if the gay nightlife scene is a shadow of its former self)." There are almost as many watering holes in downtown’s village as there are art galleries. Most cluster along S Coast Hwy and Ocean Ave, making for an easy pub crawl. Once a month, downtown Laguna Beach gets festive during the First Thursdays Gallery Art Walk. You can make the rounds of 30 local galleries and the Laguna Art Museum via free shuttles circling Laguna’s art gallery districts. Enjoy nearby hiking or mountain biking in Laguna Canyon, whale watching in Newport or Dana Point, world class golf, theme parks. The Surf and Sand Hotel, Montage, and Ritz Carlton are nearby to stroll the gorgeous grounds and visit the spa facilities. During July and August, check out The Sawdust Festival where over 200 local artists exhibit and sell their artwork. Even if you’re not interested in purchasing anything, it’s fun to go just to peruse the exhibits and chat with local artists, most of whom are very enthusiastic about their craft, and love sharing with visitors. Also, the Pageant of the Masters, which features tableaux vivants (living pictures), which are incredibly faithful re­creations of classical and contemporary works of art, with real people posing to imitate their counterparts in the original pieces. We are SoCal natives and happy to help you plan your stay. Rental fees for front house with 3 bedrooms/2 baths for $400/night or 12,000 per 30 day period. Rates and length of stay is negotiable. Entire property with both houses as compound is $700 per night or $21,000 per 30 day period.